FRANKLIN D. ROOSEVELT. Autograph Letter Signed, to Franklin D. Roosevelt Jr., ca. 1936. 1 p., 8 x 10 in. Here is check for $500 allowance (still due $1,000 less your term bill which I paid)! A very personal handwritten letter by President Roosevelt to his son and namesake, while the latter was a college student. 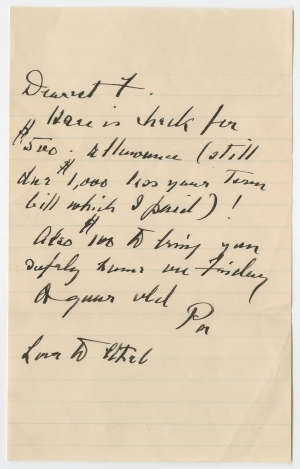 Although undated, the letter was probably written around 1936. The President mentions paying a term bill, and the younger Roosevelt attended Harvard University from 1933 to 1937, when he graduated. The President sends his greetings to Ethel du Pont (1916-1965), whom Franklin Jr. married in June 1937. She was the first of Franklin Jr.’s five wives, and they had two sons before divorcing in 1949. Franklin D. Roosevelt (1882-1945) was born in New York into an elite family. He graduated from Harvard University in 1903 and attended Columbia Law School but dropped out after passing the bar in 1907. He married his distant cousin Eleanor Roosevelt in 1905, and they had six children between 1906 and 1916. Surprising everyone by gaining election to the New York Senate from a strongly Republican district, Democrat Roosevelt served from 1911 to 1913, when President Woodrow Wilson appointed him Assistant Secretary of the Navy. He served in that position until 1920. He campaigned as the Democratic candidate for Vice President in 1920, but illness in 1921 left him paralyzed from the waist down. He served as governor of New York from 1929 to 1932, when he won the presidential election over unpopular incumbent Herbert Hoover. He went on to win reelection three times, serving as president from 1933 to his death in 1945, the longest term of any president in U.S. history. His response to the Great Depression of the 1930s was the New Deal, a series of measures to combat widespread unemployment, falling farm prices and industrial production, and homelessness. He also led the nation through World War II, effectively inspiring and mobilizing the nation to confront Nazi Germany and Imperial Japan in alliance with Great Britain, France, and the Soviet Union. Franklin D. Roosevelt Jr. (1914-1988) was born at his parents’ summer home in New Brunswick, Canada. He graduated from Groton School in 1933, and in 1936, he contracted a streptococcal throat infection, which became life-threatening. He was successfully treated with a new antibacterial drug and avoided dangerous surgery. In 1937, he graduated from Harvard University, and in 1940 from the University of Virginia School of Law. He served as a junior naval officer in World War II and was decorated for bravery. After the war, he practiced law in several New York firms. He served in the U.S. House of Representatives from 1949 to 1955, but had an unimpressive career there. He ran for attorney general of New York in 1954 and for governor in 1966, but lost both times. He campaigned for John F. Kennedy in 1960, and Kennedy appointed him as Under-Secretary of Commerce, but after Kennedy’s assassination, Roosevelt largely lost influence. He married five times, divorced each of his first four wives, and had a total of five children.